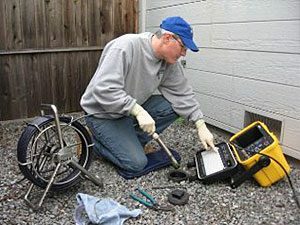 A sewer camera inspection is by far the most comprehensive method of determining if your sewer system is in good working order, needs minor repair work, or is a ticking time bomb that is waiting to explode. If you own residential, commercial, or industrial property in the Layton, Utah area it is extremely important to detect any and all problems with the sewer pipeline prior to the occurrence of a major disaster. In many cases small cracks, breaks and blockages within the sewer pipes will turn into much more severe issues when left untreated. For example, raw sewage and wastewater can leak from the pipes directly into the ground causing a tremendous environmental hazard. If the sewage materials enter into the drinking water table the cleanup alone can cost tens of thousands of dollars, not to mention the additional expense of the sewer pipeline repair. Both jobs are the financial responsibility of the property owner. In addition, when there are major problems with the sewer pipeline it may very well cause backups in the system. When this phenomenon takes place the raw sewage and wastewater flows in the wrong direction. Instead of reaching the city or town’s main sewer line, that is buried under the street, or the septic storage tank buried somewhere on the property it ends up in your home, place of business, or investment real estate. Can you imagine raw sewage and wastewater flooding your bathroom through the toilet, water faucet, or shower/tub drain? For far too many people this absolute nightmare scenario becomes a reality. Exposure to raw sewage, wastewater, and sewer gas is an enormously dangerous health hazard. In order to ensure that the mess has been properly cleaned only a professional that specializes in hazardous material cleanup should attempt the job. Obviously that comes at a hefty price tag. Interestingly enough a yearly sewer camera inspection in Layton, Utah is far cost effective than scheduling a sewer flood cleanup. The process is absolutely affordable to any property owner, is non-invasive, and takes approximately an hour to complete from start to finish. A clean bill of health will provide you peace of mind. Even if small issues are discovered they can either be taken care of immediately before turning into a real problem, or be kept track of with future sewer camera inspections. If it so happens that the plumbing technician discovers a major issue at least it can be property repaired before raw sewage and wastewater either leaks directly into the ground or invades your property. Restore Pipe Systems specializes in sewer camera inspection services in Layton, Utah and surrounding areas. We are proud to provide our valued customers with the most technologically advanced plumbing processes and procedures in the industry in order to save you both time and money. Our team of professional plumbing technicians each has years of experience in the field. They have also been trained in the most up to date plumbing equipment and techniques. Please contact us at your earliest convenience to schedule a free estimate for all of your plumbing related needs. We are also happy to answer any questions that you may have, and look forward to working with you.